The idea base if project is that to evolve it is necessary to understand what of past must be once and for all archived. In this sense, to call 100 videoartists to interpret anyone a year of the past century, besides to constitute a really global narration of 1900s, rapresent an attempt to processing the past, not by coincidence entasted to artists, and not by coincidence videoartists - due the moving imagine (cinema, television, web) is one of characterising elements of 1900s. In this sense, videoart can reasonally be consider like the form of art more inner at XXI century, and in this - hence - gifted of more suitable communicative tools for comparison on this crest between the two millennium. For the same reason, is even - potentially - that in prospect will can exercise a more significant influence on shapes of communication. To approach, through an artistic and plural look, the history of 1900s, therefore want be - at same time - a coral and visionary narration of century, its new reading in an artistic key, its interpretation and elaboration. Avoiding from a historiographical or political look, for its own nature partisan, and resorting to artists look instead, subjective and partial but not partisan, the project want exite a collective consideration on near root of our present. 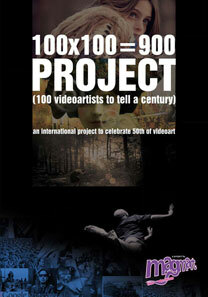 100x100=900 also call the artists to experiment a different context for their own production: indeed, even if interpretative freedom is strongly solicited, is plain - in primis at involved artists - that global vision of artworks will determine a meta-layer of reading, that include and overcome that of any artwork. This consciousness is highly probable that - even if under unpredictable shapes - will reflect itself on creative process. At same time, this is the first time that a similar project is tryed, at least for videoart, and then is an experiment itself. With absolute awareness of enormous differences, the inspiring model of project should empathize with Terræ Motus, where Lucio Amelio calls some artists to intervene - exactly in a global way - on an event of tragic greatness like earthquake. The project born in strongly continguous with Magmart | video under volcano festival, that along the years has build a community of videoartists - and a network of international organizations that are mainly focused on videoart. In this perspective, the more natural choice has been to invite 100 artists selected within the winners of previous edition of festival. From this parterre has been done an attempt to extrapolate a list of one hundred names, that includes - if possible - the max wide range of styles, but especially of cultures, namely capable to assure a look the more various possible. In any way, in fact, the final outcome of project is wanted like signed by a definite specific cultural mark - even in the awareness that, in globalization era, many differences tend to lower.